The water buffalo, also known locally as kerbau, karabau or karibo is the classic work animal in Malaysia and in general, Asia. The kerbau is considered domesticated animal as it takes special place in the traditional economic and cultural activities of human. Water buffalo is often relied upon for ploughing the rice fields and for transportation in many parts of Asia. Many years ago, water buffaloes were seen and considered as one of the indicators to one's wealth. The bigger the herd, the wealthier the individual is. Also, they were often given to the bride's family as customary dowry during wedding ceremonies of some indigenous people in Sabah. 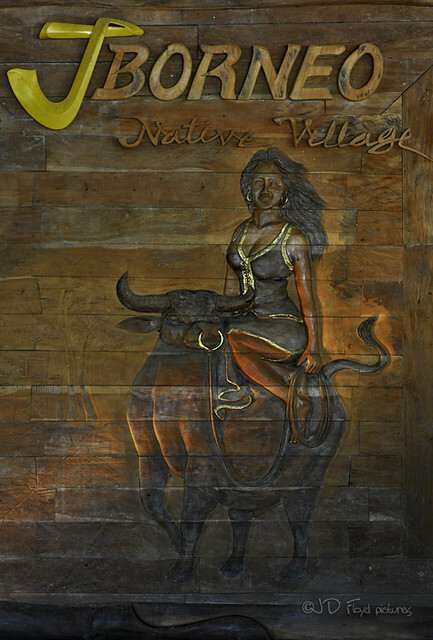 Carved wooden wall showing a lady riding a water buffalo. See more (not carving), real water buffaloes of Borneo here. @tehr. Seekor kerbau ada tak dalam RM1,500? @X lupa. Memang best tengok kan.